Equine Treats: Omega Nibblers, Likit, Horesemen's Pride, Manna Pro, Uncle Jimmy's! • Jolly Goodies Apple Treat: Jolly Goodies Apple Pellets are made with all natural ingredients with no artificial colors or flavors. Jolly Goodies has no preservatives and are a nourishing treat for horses. Provide your horse healthy 100% Dehydrated Apple Treats. Jolly Goodies Apple Treat makes a great training aid or reward after a good workout. 2.5 lb. ORDER NOW! 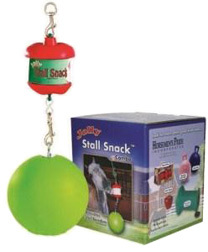 • Jolly Stall Snack w/Ball Combo: Jolly Stall Snack Combo helps lessen stall boredom. Helps make stable life more enjoyable and less stressful. Low-cost way to pamper your horse. Multi-directional movement. Easy to refill with a tasty treat for your horse. ORDER TODAY. -- Refillable Flavored Treat (NOT INCLUDED). 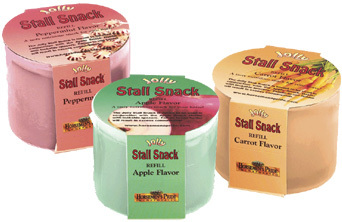 Jolly Stall Snack w/Treat: Jolly Stall Snack w/Treat consists of fun Apple shaped Holder holds a nourishing snack for any horse. The apple shaped Holder allows a horse to lick, but not bite down directly on the snack. Eliminates boredom for stalled horses. Tasty treat for your horse. Easy to refill. Economical way to spoil your horse. • Jolly Stall Snack w/Treat APPLE: Measures 5.25 x 7 x 9.25 inches. ORDER TODAY. • Jolly Stall Snack w/Treat CARROT: Measures 5.25 x 7 x 9.25 inches. ORDER TODAY. • Jolly Stall Snack w/Treat MINT: Measures 5.25 x 7 x 9.25 inches. ORDER TODAY. Jolly Stall Snack Refills: Made with Starch Molasses Dextrose Monohydrate Natural Flavoring Orange Food Coloring and Potassium Sorbate.Treat Refills that fits: Stall Snack Combo, Stall Snacks and Jumbo Lick. Use these low-cost, flavorsome treats for fun and hydration for your horse. ORDER TODAY. • Jolly Stall Snack Refill APPLE: Measures about 4 inch diameter x 2-3/4 inch high. ORDER TODAY. • Jolly Stall Snack Refill CARROT: Measures about 4 inch diameter x 2-3/4 inch high. ORDER TODAY. • Jolly Stall Snack Refill MINT: Measures about 4 inch diameter x 2-3/4 inch high. ORDER TODAY. 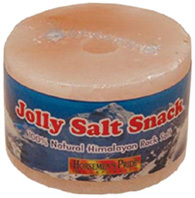 • Jolly Stall Snack Refill HIMALAYAN ROCK SALT: Provide electrolytes and salt blocks to your horses to stimulate their thirst. Horses use sweating as a method to cool off during periods of warm weather and training. Water and vital electrolytes like sodium, chloride and potassium are lost when a horse sweats. Measures about 4 inch diameter x 2-3/4 inch high. ORDER TODAY. HORSE TREATS: Jolly Goodies Apple Treat, 2.5 lb. Ginger Ridge Equine Treats: Crunchy and delicious oven baked treats. GMO Free. Made in the Netherlands. 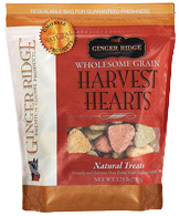 • Ginger Ridge Wholesome Grain HARVEST HEARTS 1.75 lb: Made with wholesome grains. 1.75 lb bag. ORDER NOW! 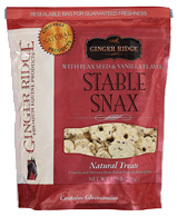 • Ginger Ridge Flax Seed & Vanilla Flavor STABLE SNAX 1.75 lb: Made with Flax Seed and Vanilla flavor. Contains Glucosamine. 1.75 lb bag. ORDER NOW! • Ginger Ridge Peppermint Fresh MEADOW MINTS 3.5 lb: Made with wholesome Grains and Carrots. 3.5 lb bag. ORDER NOW! *This state ment has not been evaluated by the Food and Drug Administration. This product is not intended to diagnose, treat, cure, or prevent any disease. HORSE TREATS: Ginger Ridge Equine Treats, 1.75 lb. 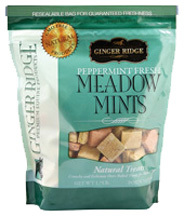 HORSE TREATS: Ginger Ridge Equine Treats, Meadow Mints 3.5 lb. Horse Snacks: Healthy and nutritious horse treat that contains natural ingredients. Fortified with chelated minerals, vitamins and yeast. Can be used as a reward or training aid. Resealable plastic bag for freshness and convenience. Highly Digestable. Feed up to 1/2 pound per day per horse. ORDER NOW! 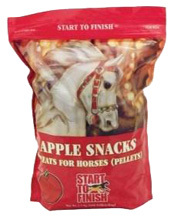 • Horse Snacks APPLE: 5 lb bag. ORDER NOW! 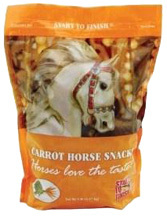 • Horse Snacks CARROT CRUNCHERS: 5 lb bag. ORDER NOW! 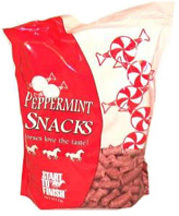 • Horse Snacks PEPPERMINT: 5 lb bag. ORDER NOW! HORSE TREATS: Horse Snacks, 5 lb. German Muffins HORSE: German Horse Muffin is a decadent blend of sweet Feed And Molasses plus Corn, Oats, Bran, Wheat Flour, Cornstarch, Soybean Meal, Dehydrated Alfalfa Meal, Vitamins and more. 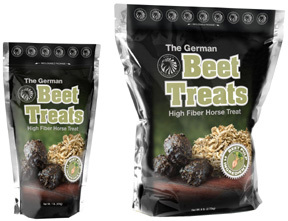 German Treats BEET: German Beet Treats is a High Fiber horse treat with Beet Pulp, the #1 ingredient helps support horse's digestive system and ease of fermentation. German Minty Muffin is High in Calories (same as oats or about a third higher than grass hay); low starch and sugar content (NSC) - about 12%. German Beet Treats is a perfect addition to your horse's regular diet and no soaking is required; feed them right out of the bag. German Beet Muffin is dry and firm. Outstanding winter treat. German Muffins MINTY: German Minty Muffin is a decadent blend of sweet Feed And Molasses Plus Corn, Oats, Bran, Wheat Flour, Cornstarch, Soybean Meal, Dehydrated Alfalfa Meal, Vitamins and more. German Minty Muffin features a sweet minty center! German Muffins HORSE 1 lb./6 lbs. German Treats BEET 1 lb./6 lbs. German Muffins MINTY 1 lb./2 lbs./4 lbs. HORSE TOYS: German Muffins HORSE 6 lbs. HORSE TOYS: German Treats BEET 6 lbs. HORSE TOYS: German Muffins MINTY 1 lb. HORSE TOYS: German Muffins MINTY 2 lbs. HORSE TOYS: German Muffins MINTY 4 lbs. Made from Premium, Human-Grade, Non-GMO, 99.9% Pure, Stabilized, Ground, Fortified Flaxseed and natural ingredients that taste remarkable - a valuable treat for your horse! Feed Omega Nibblers as desired for training, trail riding or as a nutritious anytime treat. Feed 15 treats per day when using as an Omega-3 supplement for a 1200 pound horse. • Omega Nibblers Omega-3 ORIGINAL 3.5 lb: Omega Nibblers Omega-3 are delicious, nourishing, and efficient - the ideal Omega-3 Treat/Supplement for horses (hoof, joint, and skin health). Adding Omega 3’s can help replace the pro-inflammatory Omega 6 Fatty Acids in your horse’s tissues. Less inflammation with just the normal wear and tear of life can mean a happier, more functional horse. 3.5 lb. pouch (approximately 215 treats). ORDER NOW! • Omega Nibblers Omega-3 LOW SUGAR & STARCH 3.5 lb: Nutritious Omega-3 heart-shaped Low Sugar & Starch Treat Supplement for horses made from natural ingredients. 63% LESS SUGAR & STARCH than original Omega Nibblers. Omega Nibblers Low Sugar & Starch are flavorsome and healthy Omega- treat for horses in all life stages. Apple flavored. 3.5 lb. pouch (approximately 215 treats). ORDER NOW! 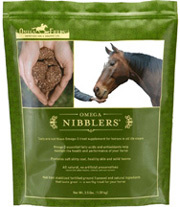 HORSE TREATS: Omega Nibblers Omega-3, ORIGINAL 3.5 lb. 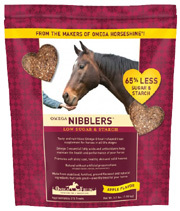 HORSE TREATS: Omega Nibblers Omega-3, LOW SUGAR & STARCH 3.5 lb. • Renew Bisquits: Renew Bisquits are the new apple horse treats that offers great taste and give your horse a winning combination of ingredients. Made with Stabilized Rice Bran with CoolStance Coconut Meal and Flax for a special, nutritious treat your horse will love. Baked with Apple, Cinnamon, and shredded Coconut. Horses and owners agree-these are the best treats on the planet. 2 lb. ORDER NOW! 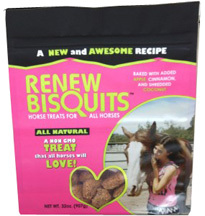 HORSE TREATS: Renew Bisquits, 2 lb. • Horse Treat Flax Enriched FLAXSNAX 3.2 lb: FlaxSnax is enriched with Flax and offers Omega-3 fatty acids for a healthy, shiny coat. Made with Stabilized Rice Bran so horses will love the taste, and Brewer's Dried Yeast for maximum digestion! 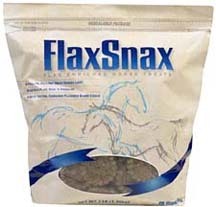 FlaxSnax are designed to provide a nourishing treat or reward for horses. They will not imbalance the normal ration. Feed 2 ounces (5 cookies) daily to provide 3 grams of Omega-3 fatty acids. You may feed up to 8 ounces (20 cookies) daily. 3.2 lb. ORDER NOW! HORSE TREATS: Horse Treats, FlaxSnax 3.2 lb. • Probios Equine Treat (Apple): Perfect for use horses of all breeds and ages. Probiotics have been found to boost animals' immune systems and healthy intestinal bacteria may help counteract stress-related intestinal disorders caused by situations such as a new horse in the field, transportation, training, or loss of a companion. Horses suffer the stressed of everyday life which can lead to bad gas, diarrhea, colic, and chronic intestinal disorders. Probios Horse Treat is a direct-fed microbial, apple flavored treat to support digestive health; lactose free. For intermittent or supplemental feeding only. The probiotics support gastrointestinal health by sustaining the good bacteria in your horse's gut. Horses love the apple flavor of these treats, which can be given alone or mixed with food as a supplement. The recommended dosage is three to six treats daily. 1 lb. ORDER NOW! HORSE TREATS: Probios Equine Apple Treat, 1 lb. • Durvet/Equine Popper Mints: Durvet/Equine Popper Mints are irresistible, bite size concentrated fortified grain treats with a sweet Peppermint taste your horses will love. Perfect for horses, ponies and mules from mini to draft size! Popper Mints should be fed with a balanced feed ration including good quality hay and/or pasture and a source of fresh water. 5 lb. ORDER NOW! HORSE TREATS: Durvet/Equine Popper Mints, 5 lb. 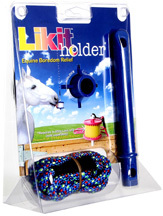 • Likit Holder: Holder is a smart toy designed to be hung freely in the stable from the rope provided and with a Likit Refill (650g), sold separately. 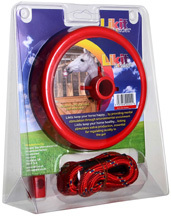 As your horse plays with the toy the Likit Holder will move, making them work harder for their reward. Perfect for new users. Easy to assemble and use, and portable. • Likit Holder RED: ORDER NOW! • Likit Holder BLUE: ORDER NOW! Treats Refills: Mouth-watering flavorsome Likit Treats are designed to be used with Likit Toys to help make stable life more fun and less stressful. Delicious formulation your horse or pony will love. Salt and Sweet versions to get their taste buds tingling. Use with (sold separately): Likit Holder or Boredom Breaker. ORDER NOW! • Treats Refill APPLE: 23 oz. ORDER NOW! • Treats Refill BANANA: 23 oz. ORDER NOW! • Treats Refill CARROT: 23 oz. ORDER NOW! • Treats Refill ICE: 23 oz. ORDER NOW! • Treats Refill MOLASSES: 23 oz. ORDER NOW! • Treats Refill MINT: 23 oz. ORDER NOW! 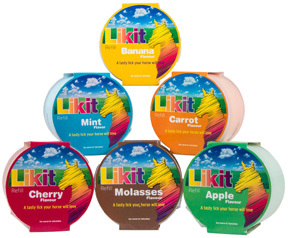 • Likit Starter Kit 6 pc: Likit Starter Kit is the easiest way to start using Likits. Likit Starter Kit has everything you need to get started. Ideal for new users. Easy to assemble and use; and portable. ORDER NOW! -- 2 Likit Treat Bar! Likit Starter Kit 6 pc. HORSE TREATS: Treats Refill, 23 oz. 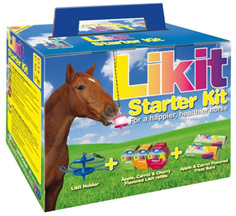 HORSE TREATS: Likit Starter Kit 6 pc.